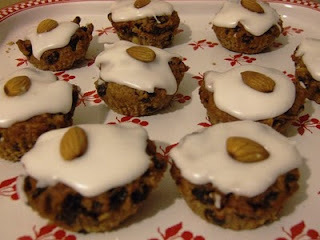 This is my normal vegan Xmas cake recipe with some minor adjustments. Pluses: these take less cooking time and are nicely two-mouthful sized. We have scoffed our big cake already and I needed something nice to bring to an Xmas tea party so I decided to try my normal recipe as individual cakes, for a change. I'm so glad that these worked. • Top with an almond or a glacé cherry or a sweetie - whatever you like! Hey Kate - that's fantastic! People hear 'vegan' and think 'Oh NO!'. Then they are amazed. Glad you liked!